Pick up the latest issue of American Vogue and you'll catch an unusual sight: A Black Woman. 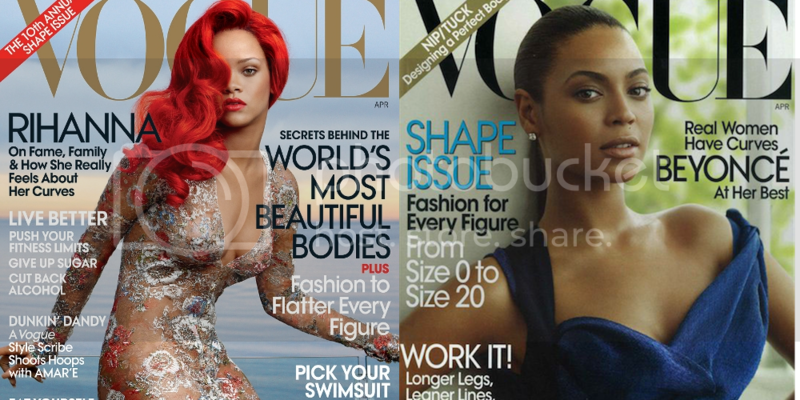 Rihanna covers the magazine's April Issue, but don't be too quick to laud the fashion Bible's inclusiveness. In a revealing gown, the pop star gives her best come hither face (or is that modeling?) to mark the magazine's 10th Annual Shape issue. This is the same issue in which Beyonce was featured in 2009; Vogue's choice to stick the two biggest pop stars in the world on their body-centered releases contradicts their intended message of beauty diversity. The glossy continually fails to embrace diverse standards of beauty choosing instead to fetishize Black women's bodies. Related Article: How Do Our Bodies Become Trends? But what else should we expect from a magazine that in it's more than 100 year history has featured only two Black women on it's storied September issue, and a total 7 women in the last decade. We know that we cannot rely on mainstream media to provide self-affirming images; however, it's irksome to think of self-satisfied execs patting themselves on the back for their progressiveness. It's also worth noting that as thin, light-skinned women, Beyonce and Rihanna represent the narrowest scope of celebrated black beauty. So what can we do about it? Naomi Campbell once mentioned that she would like to open her own modeling agency in Africa in order to find more black models, but you and I have no option but to start smaller. First, Let's stop getting so excited about seeing our images on publications that do not cater to us. One of the main reasons publications like Vogue can continues its racist practices is because we (minorities) act like starved dogs when they throw us a bone. Second, fashion lovers should take every opportunity to support women of color focused Vogue alternatives like Jones Magazine, The Fashion Bomb, Ghubar Magazine, Arise Magazine, and FashIzBlack. The fashion industry provides yet another example of an opportunity for men and women of The Diaspora to exert their influence in nontraditional ways. No, the online and independent publications we support won't have Vogue name recognition or financial backing, but at the very least we can be assured that the people behind the pages have our best interests at heart. Kimberly Foster (@kimberlynfoster) is the Editor-in-Chief of For Harriet.